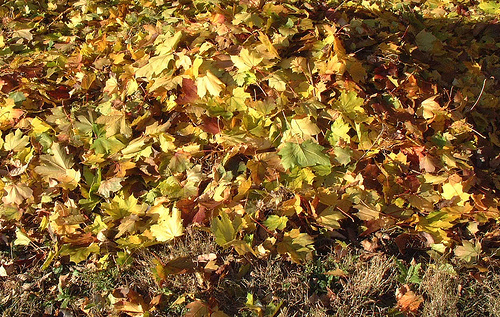 Anna on Green Talk does a great job explaining How Can Brown Turn to Green and how you can turn all of those leaves that pile up in the fall into mulch or compost. Not only is this solution free, all you need to do is invest time, but these nutrient-packed all-natural leaves will break down and help your lawn or your garden look amazing next year. Over at Feel Good Style Becky gives a rundown of some great fall inspired nail polish hues that are nontoxic and not tested on animals, so you can enjoy a great home mani or pedi, rock a dazzling fall color and know that the polish you used is safe for you and cruelty free. Hanging out at Feel Good Style a bit longer you can also follow this tutorial about how to turn any scarf into a spot-on for fall infinity scarf. Not only will your DIY infinity scarf keep you warm on a crisp fall day, but it is also a way to breathe new life into a scarf in your closet that you just don’t wear anymore or a vintage find you scored at a thrift store. We had to sneak in Reusable bags because they are perfect for hitting up late season farmer’s markets or orchards. Whether stocking up on tomatoes to make sauce, garlic to plant for next year, gourds and small pumpkins for tasty fall treats or seasonal decoration or apples, a reusable bag is a great way to carry all of your goods home and a must have fall find that works yer round. If you need to give a gift instead of wrapping the item in paper or using a paper gift bag consider using one of Paige Wolf’s fav VZWrap in a festive fall pattern. These cotton bags come in a variety of sizes, so you are bound to find a bag that fits your gift and they are reusable so they can be used again and again. This cozy cowl neck sweater is a favorite of Diane MacEachern at Big Green Purse and is a comfortable and warm, making it ideal for chilly fall weather and the designer, Mod Kham, passed the Green America screens. As flip-flop season draws to an end, Danika Carter over at Your Organic Life, thinks you should invest in a pair of TOMS. Your toes will be toasty and dry as the seasons change and if you shop from their sustainable and vegan line you can rest assured knowing that your shoes are cruelty free and made from recycled or sustainable materials. TOMS also works extensively with their giving partners to give back and help children across the world, making it an easy choice the next time you’re shopping for shoes. As the weather turns cooler and the holidays approaches, Danika also urges you to check out Rose Monsoon Hydrating Mist. This certified organic lotion hydrates while the calming scent will help you find balance. Head over to Lisa Sharp’s Retro Housewife Goes Green and read up on current makeup trends and the eco-friendly, toxin free products you can use to get the hottest fall looks. Here’s our list of 9 fall survival tips– what green item do you consider a must have for fall to fill in the #10 spot? Thank you so much for including my post. I am loving the other tips especially Lisa’s current make-up trends. Of course we would want to include you Anna! We love your work and are honored to be able to have you stop by.